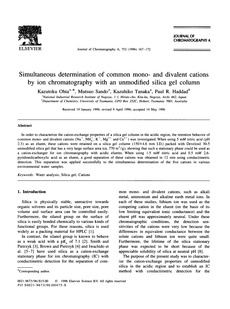 In order to characterize the cation-exchange properties of a silica gel column in the acidic region, the retention behavior of common mono- and divalent cations (Na+, NH4+, K+, Mg2+ and Ca2+) was investigated. When using 5 mM nitric acid (pH 2.3) as an eluent, these cations were retained on a silica gel column (150�6 mm I.D.) packed with Develosil 30-5 unmodified silica gel that has a very large surface area (ca. 770 m2/g), showing that such a stationary phase could be used as a cation-exchanger for ion chromatography with acidic eluents. When using 1.5 mM 2,6-pyridinedicarboxylic acid as an eluent, a good separation of these cations was obtained in 12 min using conductimetric detection. This separation was applied successfully to the simultaneous determination of the five cations in various environmental water samples.